This past Monday, feline EmmaRose and I experienced the imperative inherent in impermanence. One being can never know another completely, which is as it should be. The richness of relationship, its mystery, keeps us curious and often, in awe. As a cat, EmmaRose is ever present. 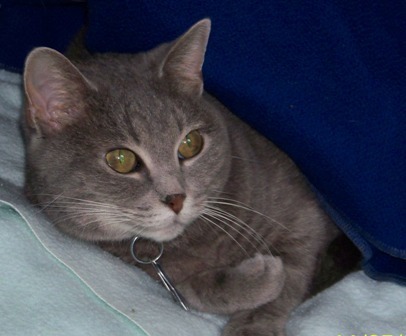 Routine is her preference for that means food and shelter—her sense of security—is not threatened. For the three and a half years she has lived with me not even the furniture has been rearranged. It seems she appreciated this more than I knew. We spend most of our time in the bedroom, which doubles as my work area. I work from an adjustable Tempurpedic bed complete with laptop and bed table. EmmaRose is quite partial to sleeping on the Internet router, especially in winter, or near/on my lap while I write. Our living room has never had much furniture. There is still a lovely antique, wooden rocker with a padded seat. It is more comfortable than it looks. 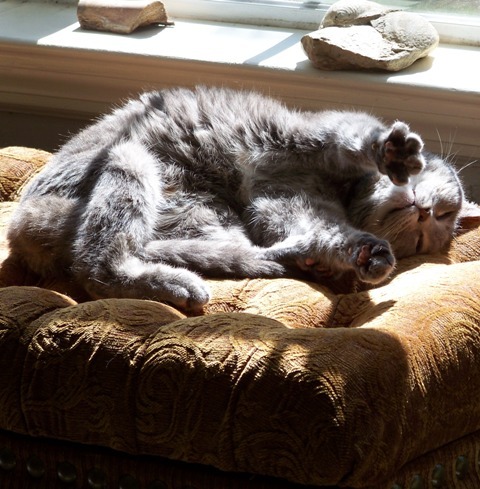 Also, there is a large, rust-colored ottoman suitable for human and feline window gazing. There WAS a twin bed box springs and mattress that I tried to disguise as a sofa-daybed. For me it was ugly, uncomfortable, an unpleasant reminder of another time. From time to time, however, I would find EmmaRose curled up and asleep on it. That I regularly removed accumulated cat hair from its quilt cover should have told me that this was a nocturnal sleeping place. Did we not once watch a possum in moonlight from the sofa-daybed? In hindsight, it is obvious that a good deal on a used loveseat and recliner changed our relationship. In fact, EmmaRose seemed to sense imminent change the moment we heard the knock on our front door. She did not watch the daybed leave the apartment, preferring the familiarity of the bedroom to wait for the moving in and moving out to cease. Only then did she return to the living room. Although she is only five and a half pounds, she has an immense presence, especially when she communicates. We don’t focus on the actual meow or word. Rather, we pay attention to tone, and her feelings regarding the loveseat and recliner were quite clear. Here we were in the reality of impermanence. The known furniture was gone and the unknown leather furniture was here. Accepting loss precedes learning to live with what is. Becoming once again secure in one’s world is unique to each being–there is no set amount of time. We can immerse ourselves into the newness of our world or we can skirt the change for awhile. Regardless, it is up to us to seek that first peace so integral to relationship, which is precisely what EmmaRose did three days and four nights later. It was during the opalescent hours, as one day becomes another, that EmmaRose beckoned me to the loveseat for window gazing. In the light of the waning crescent moon, I glimpsed an occasional firefly but soon the purr of EmmaRose brought me, too, to sleep. Thanks, Meredith. EmmaRose reminds me that decisions made in and of the moment are those that are revisited less. Even small changes in our lives can become of major significance! Exactly, Diana! I heard that from EmmaRose, loud and clear. Thanks so much, Diana! Thank you for visiting Kimchee and Catnip. I am happy you liked my posts and that I found your blog. Your writing takes me to places I have not visited in a long time. Also, on a more mundane level, I love your little palm tree rug. Thank you! 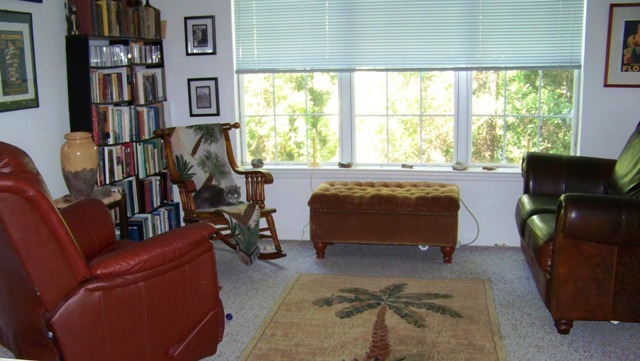 As for the palm tree rug, it was another bargain–even new–and has been amazingly resilient as it is almost ten years old. So glad you stopped by! Hope to see you here again. I really appreciated this story as I adjust to some changes and impermanence in my own life. I can be much like EmmaRose when I encounter unwanted changes. Thank you for this reminder! More and more, I actually trust in the impermanence of living. This furniture issue with EmmaRose really allowed me to watch her work through it. Also, many times I felt as if she were holding up a mirror for me. Maybe what is most critical with impermanence is remembering to allow the time that is necessary to adjust. it is what I watched EmmaRose do. Thanks so much, Kenetha. Accepting loss precedes learning to live with what is. Becoming once again secure in one’s world is unique to each being–there is no set amount of time. I know this so very well, until those moments when I’d do well to remember. I’m a great one for hanging on. And I know better. And that’s OK. Thanks, Janet. Living with animals has really helped me face impermanence mainly because they are so present, meaning they work through any issue immediately and then let it go. What I am noticing with EmmaRose is that she constantly expands her world, although physically it is only two rooms and a bathroom. Actually, the more present I am, the more she and I discover together. As for hanging on, I, too, once grasped for all I was worth, and now that is considerably less, perhaps because I trust in the impermanence of living. That said, sometimes it requires a pretty big gulp of air. As usual, Stephanie, your points are poignantly accurate. I have to say that getting to know EmmaRose has been one of my greatest delights in life. She mourned Cooper with such intensity that it was some time before she and I began to develop a true relationship. This recent furniture issue has taught us both. Thanks for all the support you give this blog. Much appreciated. The range of things cats say is astonishing – be it through a flick of the tail or the angle of their head. We used to have a cat who communicated completely this way, and we knew what she was usually on about. The cat was also very clear as to who ran the place. Her servants were not allowed to vary the routine. I sometimes pity us humans who have forgotten how to consciously understand most of our body language. Good point about humans and body language for animals really read ours. Clearly, EmmaRose and I spend a lot of time together, and I enjoy how we communicate. I like to think I am more observant of body language because she holds me to it! As always, thanks Matthew! Thanks for another beautiful, timely post, Karen. Your insight is as poignant as your writing. What a soulful kitty EmmaRose is! You two seem perfectly matched. EmmaRose has reworked our routine to include night hours on the loveseat. I read, she purrs.She has been wary of the recliner–it moves, you know–but last night, she decided to try it as long as I was in it with her. I am amazed at how much we are enjoying living in more than one room. Thanks so much for all your support, August. isn’t it amazing the amount of nonverbal communication we have with animals? we are really not so different from them at all. one of my favorite quotes is from Straw Dogs by John Gray: “that man is the noblest creature may be inferred from the fact that no other creature has contested this claim.” Although I think sometimes cats do. In all you say in your comment, Craig, there is complete agreement in this household. Thanks! Emma Rose and I have a lot in common. I like what is. The familiar. This seems to only become more pronounced as I grow older. I rolled my eyes at my live-in grandfather’s round of daily habits he called “my routine.” Now I have a set of my own.” But sometimes the absence of the familiar creates an opening for something better–like a new couch–which will quickly become just as known and loved. Thanks for the view of your living room Karen. It helps me imagine you at home. Thank you, Adrian, for giving me the word “opalescence” for those in-between hours (your comment on last week’s post). I am re-reading Cannery Row and, as always, enjoying it. As for routine, EmmaRose is now expanding hers (and thus mine) to include daily living room activities. If her “tone” is any indication, she has “embraced” the newness. It is one of my favorites as well. Thanks!